This week's update is a bit of a one-off. It's a short piece written about my two years spent living in Vietnam. I hope that it'll become part of a series but at the moment no more have been written. It's strange but for some reason my time in Vietnam has inspired very little writing. I can't fully explain why, except that of all my stints overseas, this was the least enjoyable but even so, there was still plenty to write about. For some reason though, I never did... well, apart from this. I knew from the very first day when I arrived in Vietnam that religion was going to play a major part in my life there. I’m not saying that I saw the light as I stepped off the plane at Tân Sơn Nhất International Airport or that the Vietnamese people are especially religious, (by Third World standards, they’re not), or that the folk that I hung around with were particularly pious and saintly, (by anyone’s standards, they are definitely not), but it’s just that, well, living in Vietnam, religion just kept on cropping up. And often in ways that I least expected. Take for example, my very first day there. After being met at the airport by the whole Nguyễn tribe and heading home to the family home on Lạc Long Quân to drop my bags off. 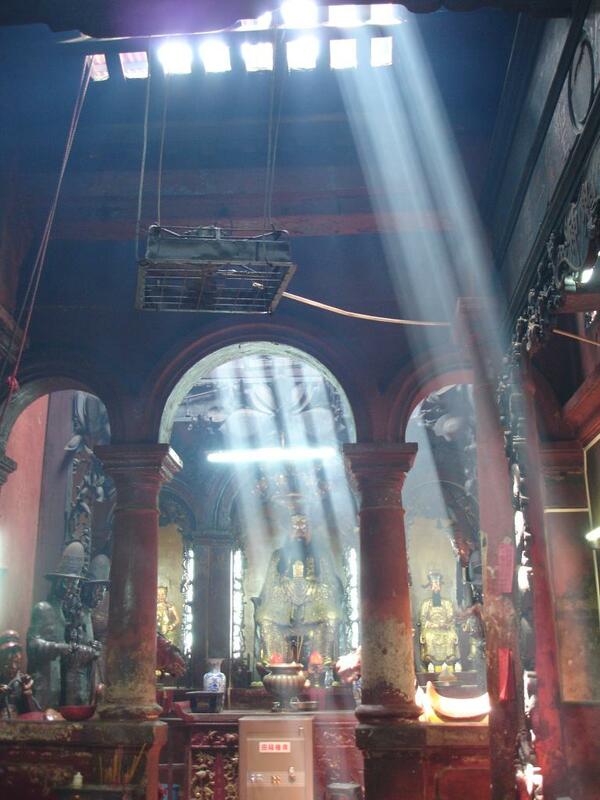 Then it was announced that we were heading straight off again to a temple to give thanks for my save arrival. Who cares if I’m not remotely Buddhist, (and so why would He go out of His way to make sure that my plane hadn’t fallen out of the sky? ), the fact was that they – or to be more particular, Huệ - had prayed that I’d arrive safely, (and even abstained from meat for a few days to make doubly sure), and since those prayers had obviously been answered, then it was time to give thanks. So, onto the motorbikes we popped and to the temple we went. But not the local neighbourhood shrine, oh no, instead all the way into the centre of the city, a good thirty-minute drive, where we then parked our bikes outside a huge temple absolutely crammed with worshippers. We made our way inside and Huệ et al hastened to give thanks, offer money where one should and the request further boons in life, which left me able to wander around the place at my leisure. And it certainly was an intriguing place to wander around. A large square complex with a myriad of deities both scary and tranquil dotted around its exterior wall, whilst just to the left of the door, a large statue of a lion which Huệ enthusiastically climbed under and bade me do the same, (“You do this, you very lucky!”), before then rubbing its eyes with her fingers and then rubbing my eyes with the same fingers, (“Very lucky for eye!”), which were already stinging from the smoke of thousands of incense sticks being lit and wafted around by the faithful. Fascinating though all this was, by this time, one thing was beginning to bug me: Huệ, Thảo and the others were all Buddhists and whilst this temple was certainly not short on gods to prostrate oneself before, not one of them was recognisable as the Buddha. And thus was my introduction to religion in Vietnam. If one quality of Vietnamese religious devotion is that it is flexible, another is that it seems to permeate into everything. The flip side of a society which will head for whichever temple gets the best results, regardless of whether it belongs to the correct religion or not, is an intolerance of anyone who does not do the same. As a practising Christian I am not meant to bow down before any false idols or eat any food offered to said idols, yet, I am afraid to say, both of these tenets of my faith flew out of the window within hours of arrival. Vietnamese Buddhists largely practise their religion at home, on shrines in the front room where the motorbikes are parked, upon which there are a number of deities, (Quan Âm and Bố Đại being popular ones as well as the Buddha Himself), a myriad of tacky and garish flashing lights, gaudy decorations and then finally, the obligatory retouched photographs of deceased relatives who, along with the gods, get fruit and incense sticks offered to them daily. Many’s the time when I awoke from my midday siesta to stinging eyes, a dry throat and a throbbing headache because Huệ had decided to offer the gods an extra-large helping of the dreaded yellow incense sticks just because she’d bought a fistful of lottery tickets and reckoned that it might help her chances. 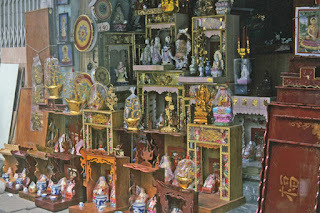 But in fact, of all the holiness on offer at the average household shrine, the photos of dead ancestors are by far the most important items for Vietnamese spirituality centres around honouring the dead. I remember once, years after leaving the country, asking a Vietnamese student of mine in England which religion he followed – Catholic or Buddhist – to which he replied, “No sir, you don’t understand. 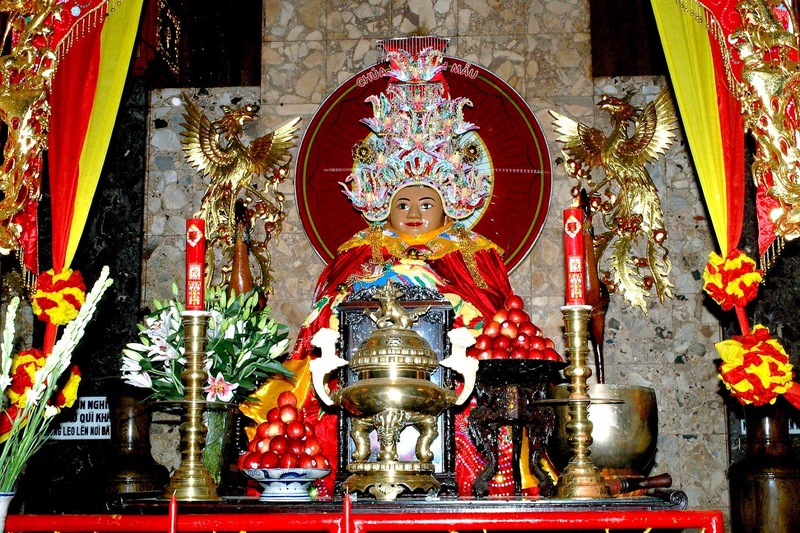 In Vietnam there is only one religion and that is ancestor worship. Maybe Catholic ancestor worship, maybe Buddhist, but deep down, same-same. 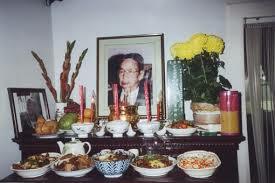 Vietnamese worship our ancestors before anything else.” And in many respects, he was telling the truth. Vietnamese Buddhists celebrate Buddhist holy days and the Catholics party at Christmas, but nothing comes close to the sanctity which they reserve for the anniversaries of the deaths of their closest relatives. I attended one of these anniversary parties once, the death day of Huệ’s mother. The entire extended family was there, a huge picnic packed and a riotous party held… in the graveyard. Now, I can be a bit of a cantankerous fellow at times and I wasn’t feeling good that day, even worse since I’d been forced to miss Mass, and this rather strange location for a knees-up rankled my very European sensibilities over what should and should not be done in cemeteries. When we got there though, my not-so-good mood was worsened even further by the fact that no one present seemed remotely bothered about the dead person present – there was no respect or reverence shown for her – and instead they just wittered on about their dogs, jewellery and mobile phones. Needing to be alone, I excused myself and walked a distance away to the Catholic part of the cemetery where there was a large crucifix which I could kneel before and focus my prayers. However, just as I’d put my hands together and closed my eyes, I felt a tap on my shoulder. I opened them to the view of a lottery ticket vendor thrusting a wad of his rather unholy wares in my face. I waved him away and closed my eyes again to pray but he stood there unmoving and despite my best efforts to focus heavenwards it was me who gave up before him. “But why on earth would he even think that I’d want to buy a lottery ticket when visiting a graveyard?” I later asked Thảo, still exasperated by the man’s insensitivity. “Because the graveyard is the very best place to buy a lottery ticket,” she replied in a voice which suggested that I must be pretty stupid if I didn’t know such simple things. Now disrespectful, annoying or just plain ridiculous this might sound to European ears, to be fair to her, she’d had direct experience of this very phenomenon. One of her favourite stories to tell was of the day when her cousin was possessed by the spirit of a dead person. Thảo was called to the house to witness this because the deceased individual in question was none other than her father and he’d been asking specifically for her, (and specifically not for his wife). When she arrived, he gave several messages to family members, telling them that everything was hunky-dory on the other side and then asking if there was anything which he could do for them, at which point one cousin requested the next set of lottery numbers. With a great degree of reluctance apparently, he gave them but they came accompanied by a warning that the said cousin should not be greedy and that the numbers he gave would only work once. The cousin duly did win the lottery that week but, being a rather greedy fellow it seems, ignored the warning of the dead man and bought a load more tickets for the following week, praying for Thảo’s father’s intercessions. He never won the lottery again after that. As I said, religion, or at least fortune and the chasing of it, permeates everything in Vietnamese life. You wake to the smell of incense; marriages, births and deaths are calculated by calendars to decide how auspicious they might be and fortune tellers are consulted regularly. I went once with Thảo and was told that our marriage would be long and prosperous (we’re now divorced) and that that summer I would come into money (I didn’t). At the end the fortune teller was not impressed when I asked why every prediction which she made concerned material wealth or physical health and not once was happiness or spiritual wealth mentioned. My son: jolly, fat and very prosperous… apparently. But there was one aspect of Vietnamese religions all-pervasiveness which I did rather like and that was how it also involved sightseeing. 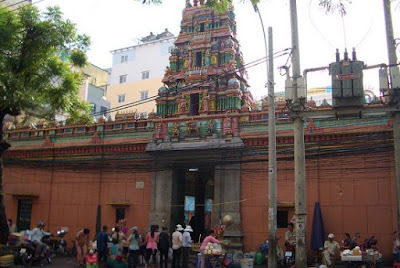 Temples were highly-regarded by Thảo and Huệ as the destinations for a jolly day out and, as a man always in favour of a day out, I was only too glad to get dragged along. 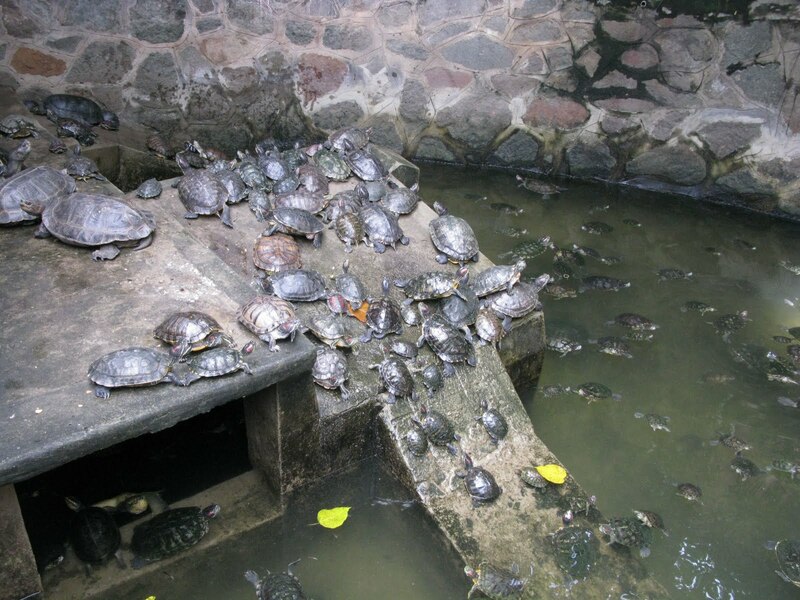 Local temples that were favourites of my wife and mother-in-law were Chùa Ngọc Hoàng in District 1 of Hồ Chí Minh City, a fascinating labyrinth of a place, dedicated to the Jade Emperor, always thick with incense smoke and noted for its pool full of turtles just outside the main entrance, and Chùa Bà Châu Ðốc 2 at Phú Xuân just before the ferry to Can Gio. This latter temple was reached down a narrow alleyway off the main road and then over a grubby stream to the shrine itself. Architecturally, it was nothing special, but it had holy credentials and, I must admit, a certain atmosphere. When I asked Thảo about it she said that it was all because the god (idol?) had miraculously come out of the waters. All very nice but that didn’t explain why it’s called Bà Châu Ðốc 2 – Châu Ðốc is a famous temple on the Cambodian border noted for its miraculous happenings and memorable for the fact that its idol is dressed in glorious gowns donated by worshippers, often wearing so many that it ends up as wide as it is tall. Another favourite trip out was to the Chùa Châu Thới near Biên Hòa just out of Hồ Chí Minh City. I was the cause of our first visit there; returning home on the motorbike from a trip to Vũng Tàu one evening at sunset, I spied it, in the midst of all the detritus that surrounds every Third World city, a small hill topped by a graceful pagoda silhouetted against an orange sky. It was scene straight out of a classical Oriental painting, or at least it would have been were it not for all the quarries, houses and industrial plants that surrounded it. Nonetheless, I commented on it and vowed to check it out and Thảo said that she seemed to remember visiting it once as a child, so several weeks later, after riding out to her father’s grave, (which is in a Heroes Cemetery nearby), we checked it out. Chùa Châu Thới fulfilled all expectations. 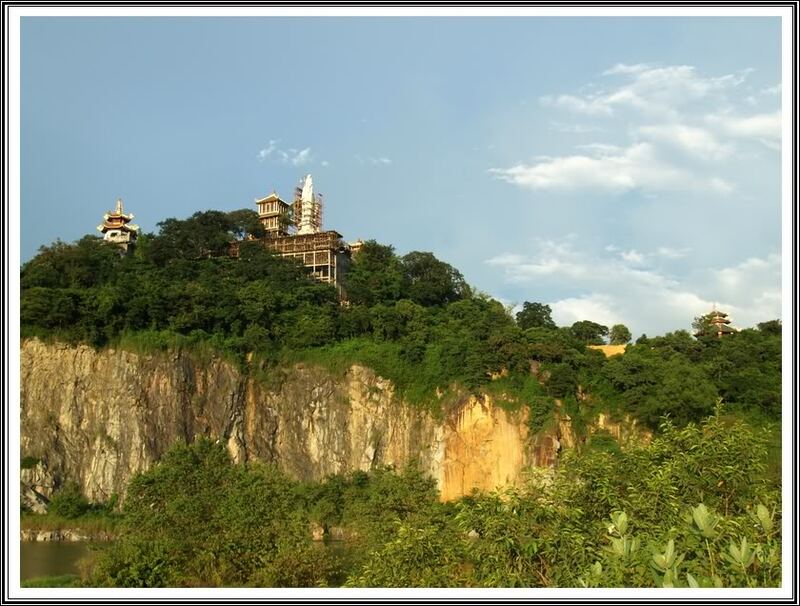 It was founded in either 1612 or 1681 (accounts vary) by a teacher named Khanh Long who climbed up the mountain to meditate and study the sutras whilst gazing out from its peak, and even today you can see why for it’s a peaceful and beautiful spot. True, there are no vestiges of the original temple left – war and accident have destroyed the complex several times and true too there’s a whacking great quarry next door but once you’re climbing up the wooded hill upon which the temple stands, the hard-working world of the 21st century seems to be a million miles away and you’re back in a simpler time. But then perhaps that’s why the Vietnamese so love their temples; as I said before, I don’t consider them to be especially religious, particularly by Third Word standards, but what the temples offer is not only faith but also a glimpse of something else, a change of scene from the relentless worship of Mammon that has so consumed the country, (and indeed East Asia as a whole), ever since the Đổi Mới reforms of the 1980s. Temples offer a momentary glimpse of a slower-paced life and I loved sipping tea in the shade of the trees outside Chùa Châu Thới whilst monkeys jump about the branches over your head, before then entering the quiet precincts of the shrine itself, ringing the giant bell as you say a prayer and then emerging onto the terrace and taking in the magnificent view where I could almost believe that the lake below me was still tranquil and pristine and that beyond it was not a noisy quarry and the industrial units of one of the world’s fastest-growing economies, but instead lush green rice paddies tended by concial-hatted workers whilst in the smog-free sky above the Celestial Emperor and other deities looked down benevolently. 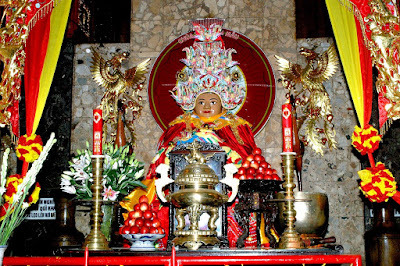 The most famous – and spectacularly sited – of all the temples that we visited regularly was the shrine on Black Virgin Mountain at Tây Ninh, Núi Bà Đen. Tây Ninh is famous amongst foreign visitors to Vietnam for two other shrines within its borders – the psychedelic cathedral and Holy See of the esoteric Cao Đài religion in the centre of town and, on the outskirts, the secular shrine of the Củ Chi Tunnels in which the Viet Cong guerrillas hid for years only fifty miles or so from the heart of South Vietnamese power, launching operations which had a decisive impact upon the eventual outcome of the war. However, for every foreign traveller drawn to the region to sample those two Vietnamese delights, there are dozens of domestic tourists who come to pay homage at Núi Bà Đen. Núi Bà Đen is an ancient, Khmer religious site relating to a female deity whom legend says was a woman who fell in love with a soldier who betrayed her so she committed suicide on the mountain. It was originally remarkable for its setting, the main temple of Linh Sơn Thiên Thạch, which sits two thirds up the slopes of the mountain, an extinct volcano and the only raised ground for miles around. It can be seen from huge distances and the views from the temple are incredible, stretching all the way to Hồ Chí Minh City and beyond. Attained by a stiff climb of several hours up lush slopes sprinkled with huge volcanic boulders, the thirsty, aching, sweating, cleansed pilgrim would eventually arrive at the shrine spiritually prepared to embrace the Divine and behold the glories of Creation. I said “was originally remarkable” and “would eventually arrive” because that was then and this is now. In the 21st century Núi Bà Đen is equally remarkable for its rampant commercialism in a very East Asian fashion. These days few if any pilgrims walk up to the temple for there’s now a cable car to take you up and en route, as you drift over the boulders, shrubs and ravines which once caused so many troubles for the hardy pilgrims, you may now feast your eyes upon lifesize plastic models of Doraemon that wave, flashing plastic Chinese dragons, luminous plastic palm trees that glow at night and the litter dropped by thousands of pious souls. And if that were not enough, then going back down, whilst you may choose to take the cable car again, there is nowadays an alternative option. Walking? No, don’t be silly, why walk when you can instead take a sliding car which whizzes down its silver bobsleigh track – speed up and try to hit the pilgrim in front but don’t dare drive too slow or the spiritual seeker behind you will ram into your backside! And when it’s all over, you’re deposited at a funfair where bubblegum pop music plays continually on loudspeakers, there are bins shaped like zoo animals and food, drink and ice cream outlets. But what is most remarkable of all about Núi Bà Đen is the attitude of the locals, including the monks themselves. Are they offended by this Disneyification of a sacred site, the transformation of a secluded spot of quiet contemplation into a blasphemous, second-rate copy of Alton Towers with a plastic deity or two thrown in for good measure? Does all of that rankle with their pious sensibilities? Does it hell! They don’t mind at all, in fact they can’t see why I do. What’s wrong with a cable car? It saves the legs! And why moan about the waving, grinning Doraemon? He’s cute! And as for the lollies and cans of coke on offer? Well, what are you drinking this moment Matt, and did not the writing on that wrapper you just put in the bin say ‘Magnum’? No, perhaps it’s you who’s lost your sense of reason, not us? And do you know what, when you sit down on one of the benches by the zoo animal bins and see all the young couples holding hands and smiling, the children playing and the grandparents remembering their youth, then maybe, for a shrine dedicated to a young lady who once fell in love, that is not so wrong after all. But any discussion of my experiences of religion in Vietnam can never be complete without mentioning a trip – or to be more exact, a pilgrimage – that I took one weekend to Cà Mau in the far south-western corner of the country. Like so many things in Vietnam, particularly when temples are involved, this was a communal affair. The local neighbourhood of Thảo’s cousin Dan had hired a coach and they were doing a tour of the holy places of the Mekong Delta. To make up the numbers we – along with several visiting Western friends of mine – tagged along. The first stop was Châu Ðốc which I’ve already talked about, where we ogled the over-dressed goddess and checked out a memorial to those killed by the Khmer Rouge there. Then we were allowed to take a siesta in a pilgrim rest house before travelling overnight – and being kept wide awake and “entertained” by some truly awful Vietnamese comedy videos – to Cà Mau, the city on Vietnam’s far south-western tip. However, at around six in the morning, in a flat, uninhabited wilderness of rice paddies some distance short of our destination, we pulled up and everyone trooped off the bus. There was nothing there whatsoever save for a roadside café serving phở and a tiny Catholic mission church where there was a Mass in progress. Immediately I assumed that this was simply a stop to refuel ourselves for the day ahead, but no, everyone totally ignored the restaurant and instead wandered across the road to the church. What was going on? Why was a coachload of devout Buddhists on a pilgrimage heading to a Roman Catholic Mass? Confused, I followed them, but instead of entering the church where a priest was busy preaching the Word to a scanty congregation, they all passed by the entrance and wandered up the side of the building and then round the back. And at the back of that church was a corrugated iron shack in which stood a lifesize statue of a Catholic priest and, to my amazement, all these Buddhists on a pilgrimage were busy bowing down before him, offering him pineapples and incense sticks and rubbing his eyes and then their own just as I had seen with the lion in the Hindu temple in an attempt to improve their eyesight. It was surreal and it begged a simple question: Why? In the café after Mass I got my explanation. The statue was of one Fr. Francisco Trương Bửu Diệp and it stood on the site of his grave. Born in 1897, Fr. Diệp had been the local parish priest until war broke out in 1945 when he was advised by a superior to leave for a safer location, a suggestion which he refused with the words, “I will live with the flock and if necessary, I will die with them.” And a year later, on the 12th march, 1946, exactly that happened when he was captured by the Viet Cong along with seventy of his parishioners. Local legends say that he was offered his freedom but he refused and instead died in place of his flock, thus becoming a martyr. Why he is so venerated by the Buddhists however, (as well as the Catholics of course), is because he was a great healer in his lifetime who made no distinction between the creeds of his patients and, after his death, miraculous healings have been associated with his relics which were located after Fr. 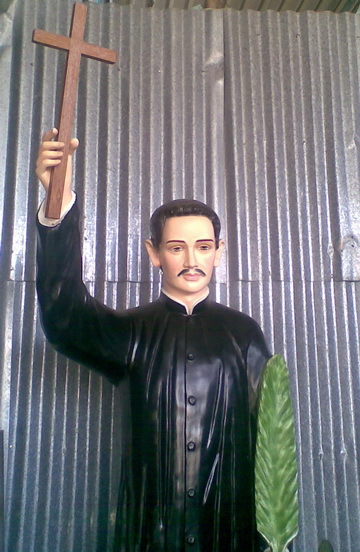 Diệp appeared to a local Catholic in a dream and, when discovered, were uncorrupted. And that is where I shall finish this short look at the traditional religious culture of Vietnam, often described as Buddhist, but including very little of the Buddhism recognisable to Western readers of the sutras. Traditional religion in Vietnam cannot be defined by dogma or creed, but is instead a complex patchwork of beliefs drawn from all over the place, from Khmer Hindu idols found in the river, the ancient Chinese celestial emperor, a heart-broken lover deserted by her soldier beau, a myriad of Indian deities, a martyred Catholic priest and your own dead family, the Vietnamese veritable live the spiritual salad bar, eating from any dish that is tasty and provides them with the answers to their prayers. To a European brought up in a country torn apart for centuries by minor doctrinal differences of two similar branches of the same faith, it is alien, but then isn’t embracing the alien the very reason why we travel? This reminds me of a quote by the Iranian Ambassador which I once read in the Saigon Times which I found to be particularly amusing. There was a high-level Iranian diplomatic visit to Vietnam, (one of the few countries that actually speaks to Tehran), and the Iranian Ambassador was waxing lyrical on the two countries’ relationship. “We have much in common,” he began, “such as the fact that both of our peoples have overthrown repressive governments in revolutions…” Here, though, he ran out of similarities as the two countries really do have little in common beyond kicking out decadent capitalist regimes. However, obviously not a man to let such a tiny thing as reality stand in his way, Mr. Ambassador continues, “…and Iran is religious with the Ayatollah Khamenei guiding our path forwards whilst in Vietnam the temples are always full.” Really Mr. Ambassador, ‘the temples are always full’! Is that the best you could do…? 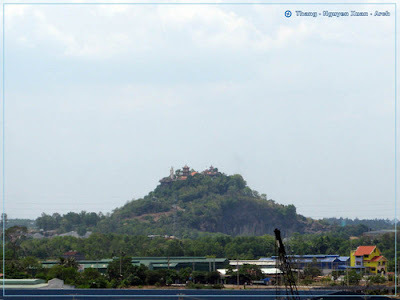 The temple that we visited was the Mariamman Hindu Temple on Trưong Ðịnh. It is reputed to have miraculous powers. 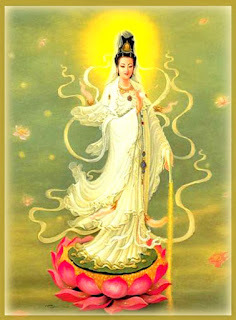 The Goddess of Mercy. In China she is called Guanyin and in Japan, Kannon, (from where the camera company name Canon comes from). The Laughing Buddha. In China he is called Budai and in Japan, Ho Tei. Our son was a very auspicious Golden Pig, a combination which only occurs once every six hundred years or so. Apparently, this is because a pig is jolly and fat, which is also symbolic of wealth. 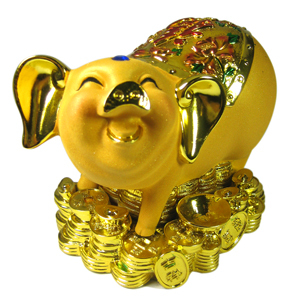 Vietnamese (and Chinese) folklore has it that a child born in the Year of the Golden Pig, will certainly experience a prosperous and healthy life. Note the focus on material prosperity here. Her full title is ‘Bà Chùa Xứ Núi Sam’ (The Sam Mountain Lady). French anthropologists and historians state that the idol is a statue made by the pre-Angkorean Khmer people who lived in the region and is a feminised version of the Hindu god Shiva but local legends state that the statue grew naturally from stone and was found by villagers after the goddess appeared to some people in a dream. 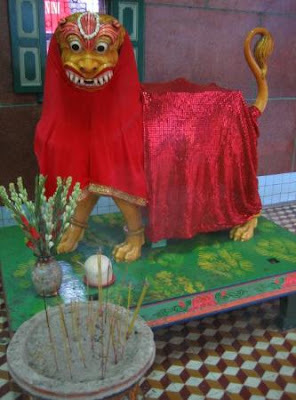 It may be this aspect of her legend which connects her with the similar idol at Châu Ðốc 2. Whatever the case, the deity of Châu Ðốc is a prosperity goddess who brings wealth to those who ask for it and who protects the border with Cambodia. This was the Ba Chúc Massacre on 18th April, 1978 when Khmer Rouge soldiers crossed the border from Cambodia (then Kampuchea) and massacred 3,157 local villagers, (only two survived the slaughter). 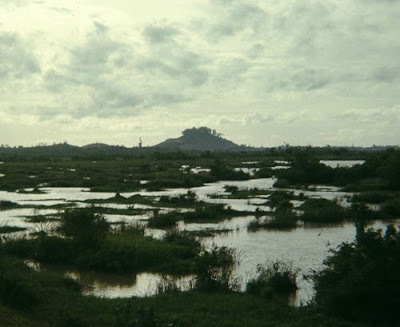 Their motives were never clearly explained although traditionally many Khmers think of that area as their land occupied by the Vietnamese. This unprovoked attack was one of the main causes behind the 1979 Vietnamese invasion of Kampuchea. Incidentally, this should not be confused with the 1957 Châu Ðốc Massacre in which 17 people were killed by anti-government forces, possibly communists or followers of the Hòa Hảo sect. Incidentally, researching for this article I discovered that the whole site, which is named Tắc Sậy was levelled and rebuilt in 2004 and that today a grand basilica occupies the spot where the humble mission church once stood. Probably necessary to accommodate the thousands of pilgrims but in my mind, a bit of a shame and I wonder whether Fr. Diệp himself would have approved of it…?